First off, I apologize for being silent for so many months. Life has been chaotic and frankly…I’ve been running on empty…Exhausted in all aspects of mind, body, and spirit. I try not to pass on negativity so I kept to myself and while the holidays approach, I am thankful for the continued support I receive online and locally…but I did have to close down the expanded retail space back to the smaller and cozy shop size as, unfortunately, buyers were few and far between in the past quarter. I cannot give up…I work too hard to just keep the shop going…to aid those that find me as well as those that seek my help. I say “cannot” because it’s is truly what I feel I should be doing…and the thought of closing the doors on options for all of you…makes me sad deep within. So…I am thankful for those that find me…that share their stories with me and allow me to help how I can. I am thankful for those that I find…that allow me to share my stories…and help me as they can. May you all have a wonderful holiday ahead and while life may seem to be a climb…may you find those that aid you to at least have stable footing for a time when it gets difficult to breathe. BB to all of you! 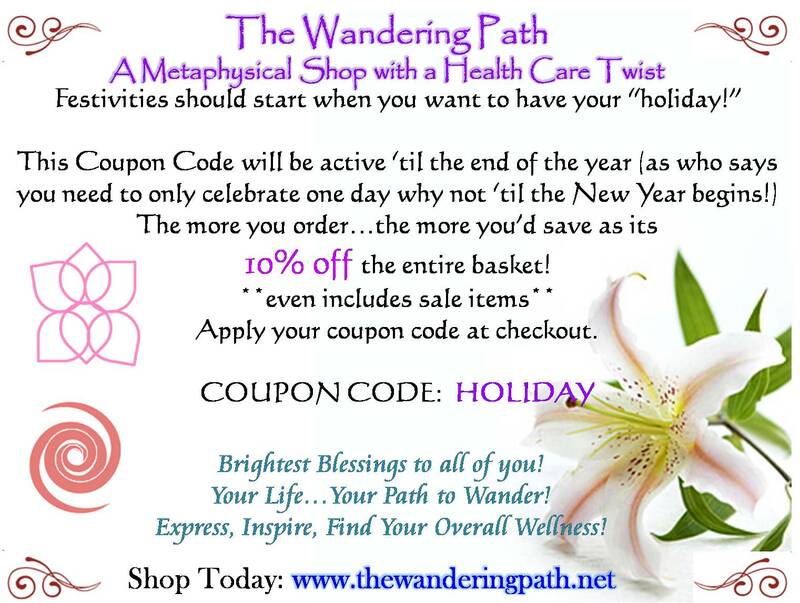 –Liza M., Owner, The Wandering Path. Good Afternoon all, it’s Liza the Owner of The Wandering Path. I apologize for the lack of blog postings but rather than post things negative or down-trodden I wait until I have something I want to share with you that is helpful, hopeful, or just a bit of fun educational. The past six months I’ve been battling on/off a re-occurring sinusitis coupled with other physical ailments including massive insomnia that just aggravate my normal pain tolerance levels. Last night…rather than just putting my “Sandman I’m ready” blend just on my face to make me sleepy…I decided the forearms, feet, and shins were all aching a bit too much and I wasn’t about to get up again and go look for the other blends I usually use on those (Help my Sore body – forearms; Help my Achy Feet for…you guessed it…the feet). Well…hmm…I actually slept much longer than I have been in some time (3 am went right on by without needing to announce itself to me). I got up at a decent hour but was very comfortably “numb”. For those that live with chronic pain…this is an incredibly blessed experience to have….although…I admit, driving to the store I was more “hmm…that’s nice” mode than “pay attention to the tourists why don’t you!” So safe to say I did the bare minimum so I could come home. It is now mid-afternoon and so far the only things that have started to “pang” is the face (stupid allergies acting up…need to take another Wellness) and my feet have begun to complain a bit…but the rest (back, legs, arms, etc…) are all still wonderfully numb. For the first time in months I was able to eat a meal without swearing…if you’ve had bad sinusitis you know what I’m talking about as your teeth and muscles in your face really complain when you try to move them. I thought I’d share this new bit of “that’s interesting..hmm…” option of something I had made up to help me combat my insomnia that apparently if you put on all over….may actually help beyond just resting …. First thoughts are I am breathing so much of the relaxing the body& brain (make that melatonin) that I’ve kinda given myself an aromatherapy mega relaxant…ha! Here’s to hoping I can continue to at least enjoy a few more hours of feeling perhaps like I did decades ago. –Blessings to you all & here is to hoping that when I read this later it is a cohesive thought process and not a “oi….yep, even the brain was super relaxed”. Liza M; Owner, The Wandering Path LLC. Good Morning all, it’s Liza the Owner of The Wandering Path. I realize I haven’t posted in quite some time and it has come down to one word echoing in my mind more frequently lately…disheartened…the state of being where one begins to lose hope and confidence in what they are doing. After two years in business…I recognize I’m not the most “money minded” business person. I run my business more on my gut and moral instinct. I can’t bring myself to overcharge. I try to be fair minded and kindhearted. I regularly share my personal struggles; listen to the struggles of others; share my research into my products as well as how you can use them to help save you money and also make your own items to help you heal in both body and spirit. I could, like many places I seen, mark up my items or even mark them up and then put them on “sale” so you can seem to get a better deal. I could take extra funds and print off prettier labels or even hype up things to make it seem as if it is an item you absolutely must have rather than keep the prices much lower and let you decide if it is an item that will improve your life and outlook. I rely on word of mouth rather than on paying for spam advertising. Even when the cost of re-stocking items goes up; I take a hit rather than raise the price. If a time period comes around where particular items could be used or given I drop the prices because I truly want you to enjoy them and let them help you enjoy your lives. In the New Year I shall have to try to find another position (again) to help supplement my income as you cannot live in society today necessarily doing what you love doing….although I’m trying my best to be hopeful for the future and that perhaps one day, very soon…my approach will be rewarded and that consumers will recognize the value in supporting businesses that operate with the care of people in mind instead of the size of the income earned. I do wish you all the best holiday season and the brightest of blessings to you all. –Liza M; Owner, The Wandering Path LLC.